El Dorado – “The Gilded One.” A tale about the New World circulated starting in 1638, about a king who for his coronation would be ritually covered with gold dust and given piles of gold, all to be sunk in a lake. The story inspired numerous conquistadors to search for the lost gold of El Dorado, whose name came to signify a lost city of gold. In 1953, a year after displaying a show car named Eldorado for its golden anniversary, the Cadillac Division of General Motors started to use Eldorado as the name of its top of the line model. Cadillac made several types of Eldorados through 1966, all of them expensive aspirational cars made in small numbers, the ultimate being the 1956-57 Eldorado Brougham. Production peaked at 3,950 in 1954 and never exceeded 2,500 after 1956, until the Eldorado became a mass produced front wheel drive personal luxury car that sold 17,930 in its first year in 1967. 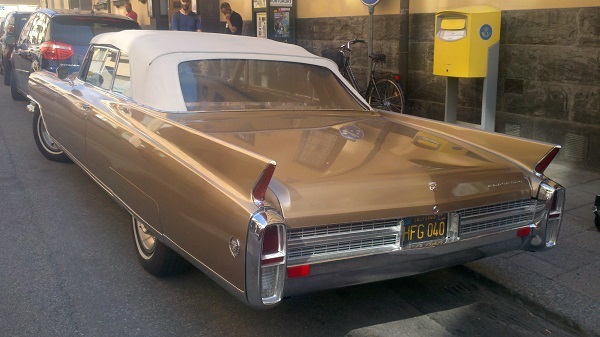 Ten years after the introduction of the Eldorado, this example in Frost Gold (an Eldorado-only color) rolled off the assembly line, one of only 1,825 made in 1963, all of them convertibles. 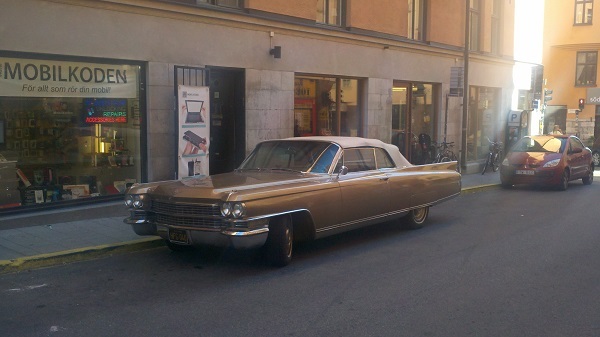 Fifty years later, it survives as a daily driver parked on the street, far from its birthplace in Detroit – in Stockholm, Sweden. A gold Eldorado on its golden anniversary is as golden as a car can get, and when it is one of a few hundred survivors left in the world and continues to be driven on a regular basis in Europe, it is truly exceptional. That this car is a daily driver parked on the street is beyond question, because the author saw it parked on the street for months, and it had moved between every spotting. The car must be garaged and stored away during Sweden’s long and harsh winters, like most of Sweden’s classic American cars, because the body and chrome appear to be completely rust free. Its bumpers and grille have survived free of dents despite the tightness of street parking and the nearly universal fitment of trailer hitches to cars in Sweden, indicating that other drivers treat it with a great deal of respect. Some argue that the 1963-64 model years were the high point for Cadillac during the 1960s. From the point of view of styling, this argument has a lot of merit. The styling of these cars succeeds at being both distinctive, with real fins, and clean, with smooth flanks that eliminated the lower skeg fins of 1961-62. This Eldorado’s interior has bucket seats and a center console, lots of wood trim, and the Autronic Eye automatic high beam dimmer. The white band across the speedometer is a kilometers per hour scale added to the speedometer using adhesive tape. Vintage California license plates front and rear are a nice touch, and the owner of this car appears to be able to operate the vehicle with only these plates, and without current Swedish plates. California, Montana, Sweden. Where else has this well-traveled Eldorado been during its first half century? A gold Cadillac was a recognized symbol of success and affluence in America for many years. In the 1950s, a hit Broadway play and motion picture named “The Solid Gold Cadillac” parodied big business and corporate corruption. In the 1970s, the great Philadelphia Orchestra conducted by Eugene Ormandy was “the solid gold Cadillac of orchestras” in the words of one music critic. 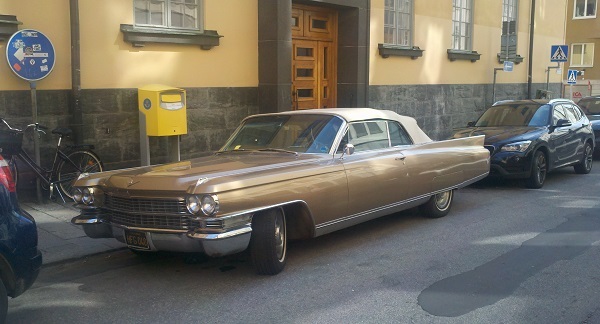 An especially golden Cadillac driven daily on the streets of Stockholm, this 1963 Eldorado is a symbol of America and its automobile industry at their peaks that continues to provide transportation to a very fortunate Swede, who no doubt knows exactly what he has. May it continue to roam the streets overseas for many more decades to come. Oh, my. I owned a thoroughly used and somewhat rusty ’63 Fleetwood Sixty Special sedan for a bit in the late 70s. 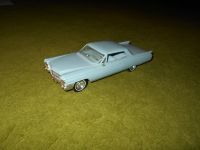 It quickly ate through my meager resources and I had to sell it before some other expensive Cadillac-only part broke. Even so, that car reeked of quality to me. Had it been better cared for over the second half of its life, my experience might have been happier. When I think “Cadillac”, the ’63 is usually the first one that comes into my mind. 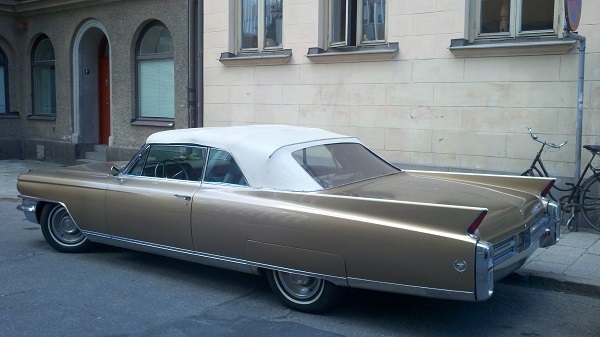 It had the clean flanks of the Continental, but enough traditional “Cadillac bling” to give the car some spice. These things are really, really big cars. And for their size, quite fast. That super-low first gear in the 4 speed Jetaway HydraMatic mated to the premium gas high compression 390 in my car made for some impressive acceleration in my youth. Some impressively high fuel consumption, too. 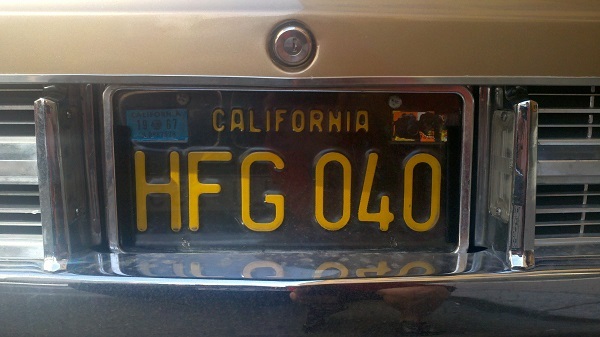 How much pull do you have to have to just drive around with a California tag that expired in 1967? Or are Swedish traffic laws that liberal? Here u can create a personalized plate with the US rego on it. What is it about having the front wheels turned slightly that adds so much to photos of cars like this? For me it changes the entire personality of the photo with the front wheels at an angle, and the way the car sits on its suspension. I liked the skeg finned ’62, but not the ’61. Go figure. Just did not like the jet tail lights on the ’61 or the similarly themed ’60, as well as some other details. Cadillac style, and especially the quality of so many interior bits was at a definite high from ’62 through ’66. I got a little bit of time in a couple of DeVilles from this era as a child. Also, as a brief owner of a well used but original ’65 Riviera, I can attest to the nature of GM luxury interiors during this time. While doing some maintenance to the real wood trim on my Riviera, I removed the center AC vent diffuser. Heavily chromed solid metal. I whish I would have put it on a scale, it was incredibly heavy. Difficult to do today when you have to account for the weight of all the safety and comfort stuff, you have to drop some weight somewhere. It seems to me that having the wheels turned implies or imparts motion to the photo. The “metal”, as you refer to it, is more than likely zinc, which was used for trim pieces extensively at this time. Zinc casts well and can hold very fine detail. It also accepts chrome plating well (triple chrome-copper, nickel, chrome). The plates may be some sort of vanity plates, following the ABC 123 pattern of registrations in Sweden. Though, I’ve never seen one of those before. Or perhaps he’s driving semi-illegaly, switching to the “real” plates on the bi-annual inspection day. Some people here with US cars register them with the same numbers as the old US plates. It’s not legal but they get away with it most of the time. My favorite Cadillac model year, bar none. How beautiful. Although I wasn’t there to witness it, my father told me my grandfather’s first Cadillac was a gold 1959 Sedan DeVille (following a big year at the office in 1958-59, he immediately upgraded from an Oldsmobile Eighty-Eight). One picture of it survives, an aerial shot taken from a helicopter which he hired to fly over the new house he also built that same year and snap pictures. They’re black and white, so I can’t tell if that giant rectangle with fins that is clearly visible on the front lawn is really gold, or not. My dad got the pleasure of driving his next Cadillac, probably a ’62 or ’63 since he traded them every 2-3 years for the resale value, to a few parties and dances his senior year at school. That’s how you kept up with Jones, Cadillac had such a high resale value that you could trade up for not much $$$ every couple of years if you wanted to. Yeah when you mention Cadillac these are what leaps into my mind not the bloated rubbish available later on, build quality must have been ok as there are Limos this model still in regular service here, All Caddies we have are imported used as they were not available to us new one customer of my Dads wanted one in 65 and got turned down he settled for a Buick in the end coz a RHD Cad was out of the question now we can bring them in leaving the tiller on the left to steer your barge with. Could be…but how does he feel about Broughams? If cars could tell their stories this one would be fascinating. These were great years for Cadillac and this car is stunning. Cool that is has bucket seats and console – a real California car. This was a kit assembled car I’ve had since 1963. 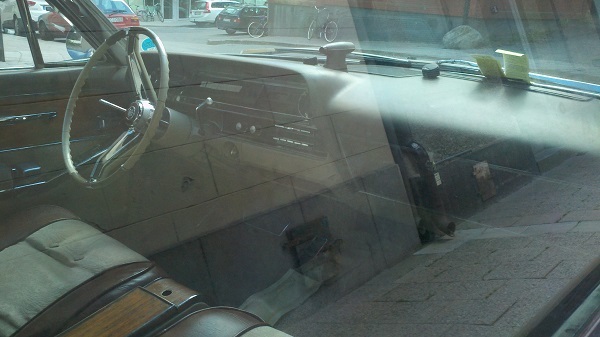 Note the Mopar style placement of the chrome rear view mirror on the dash. This Caddy looks rather like a 1959 model customized by a sane person. Most of the same styling elements are there, but toned down. The grinning grill, the character line on the front fender and of course the fins are all there, but muted. The result is a much more attractive car. The 1959 Caddy is just plain ridiculous, but this gold baby is another thing altogether, even though the family resemblance is quite obvious. Still prefer Cadillacs built before 1957 and after 1965. I don’t trust the x-frame. Oh this car is gorgeous I just wouldn’t want to own it. I see that it is parked on a curbside painted yellow. In the rest of Europe that means ‘no parking’ if true in sweden no wonder nobody bumps into it. The owner must have a shop on that street. Nice to know swedish cops are just as incorruptible as the rest of the world. Oh my lord, I can’t believe this car actually made it to Sweden. Here’s the story… In 2000, I bought this car from Helena Montana and drove it back to Connecticut sight unseen. It took me three days. In Chicago, I smelled coolant and pulled into a highway rest stop. Sure enough in the shop there was one very dusty can of BarsLeaks. In it went and I finished the trip. From CT, I drove it to Thunder Bay Ontario, Canada to have the body stripped and painted and the chassis and mechanicals freshened. The body shop that my father in law recommended did a great job but the garage messed up the engine and after driving it home, I had the engine rebuilt. It never ran right and I lost interest. It was going to cost me another $5,000 to finish the interior any way, so I listed it on eBay. After a week the car sold to a man from Sweden who’s son was going to school in CT. He came and picked it up along with a number of parts and literature I had collected over the years. What a hoot that a few years ago there it is in Sweden untouched on the streets. The interior really is garbage… homemade by the previous owner. What a remarkable coincidence that you read this article and recognized your Eldorado. I saw it on the streets in Stockholm for months and wish that I had met its owner at some point, and hearing from you about the car’s history is about as good. 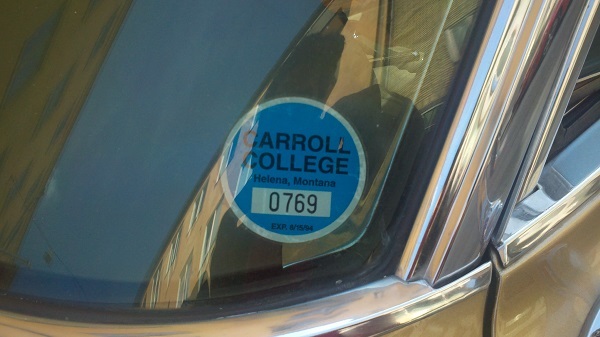 We now can add a Montana-to-Connecticut road trip and restoration in Canada to this car’s already far-flung history. Its home in 2013 was in the Sodermalm district of Stockholm, which is on a large island just south of the city center. It is a formerly working class area that has become a young professional and hipster neighborhood, sometimes called “Hipstermalm.” I am guessing that the son of the buyer is now the car’s owner/driver. 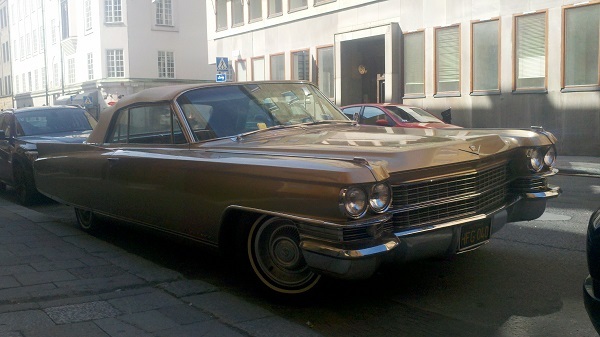 He must be a happy member of Sweden’s American car community, having one of the largest and rarest of Cadillacs.